The most dramatic early eyes known up to now have been, not surprisingly, the calcite eyes of trilobites. These mineral lenses, formed into a compound eye, lend themselves to fossilisation, plus there are millions of fossilised trilobites lying around in rocks. In the latest issue of Nature, there is a dramatic description of an incredibly tiny fossil from Australia that reveals that at least one organism from the early Cambrian – 515 MY ago – had eyes that were incredibly complex and modern. The work was carried out by a group from Australia (with help from the Natural History Museum in London), led by Michael Lee and John Paterson. They studied rocks from the Emu Shale in Kangaroo Island in South Australia. This is a famous layer of shale which contains some exceptionally preserved organisms, and is a useful comparison with the Burgess Shale in Canada and Chenjiang in China. The researchers found a number of isolated fossilised eyes that had apparently come from some kind of arthropod. They are about 7 mm long, are curved, and are composed of up to 3,000 individual lenses or ‘ommatidia’. They are not made of calcite, and they are not from a trilobite. They are incredibly beautiful. The eye of the robber fly is included for comparison. These were NOT from a fly! They are from a marine organism! 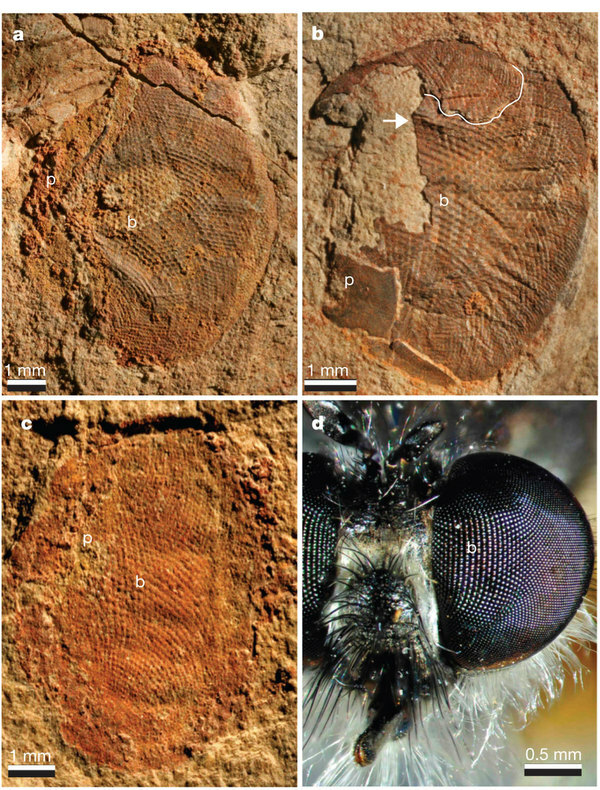 a–d, Three fossils of compound eyes from a large arthropod from the Emu Bay Shale, South Australia (a–c), shown in similar hypothesized orientation to the compound eye of a living predatory arthropod, the robberfly Laphria rufifemorata (d; anterior view of head). All fossil eyes have large central ommatidial lenses forming a light-sensitive bright zone, b, and a sclerotized pedestal, p. Because the fossil eyes are largely symmetrical about the horizontal axis, it is not possible to determine dorsal and ventral surfaces, and thus whether the eyes are left or right. All fossils are oriented as if they are left eyes (medial is to the left of the figure). In b there is a radial tear (white line) with the top portion of the eye displaced downwards to overlie the main part; extensive wrinkling causes some central lenses (arrow) to be preserved almost perpendicular to the bedding plane. Cambrian arthropod eye. a, Entire specimen showing the positions of close-ups in c and f. b, Relief-map three-dimensional reconstruction of a. c, Close-up of large ommatidial lenses in the bright zone, with white line and numbers referring to the cross-section shown in e. d, Relief-map three-dimensional reconstruction of c. e, Cross-section through four large lenses indicated by the white line in c; numbers refer to individual lenses represented by concavities. f, Close-up of small marginal lenses, with white line and numbers referring to the cross-section shown in h. g, Relief-map three-dimensional reconstruction of f. h, Cross-section through four small lenses indicated by the white line in f; numbers refer to individual lenses represented by concavities. The authors then go on to look at the optics of these eyes, in terms of the density of the ommaditidia. And report that this kind of complexity and density has previously been found only in the the Ordovician, around 40 MY later. The large, unnamed Tuzoia species from the Emu Bay Shale has stalked compound eyes that are ovoid to round and 6–9 mm in diameter: very similar to the fossil eyes described here. However, no detailed structure of the visual surface is preserved in the articulated eyes of Emu Bay Shale or Burgess Shale Tuzoia specimens. 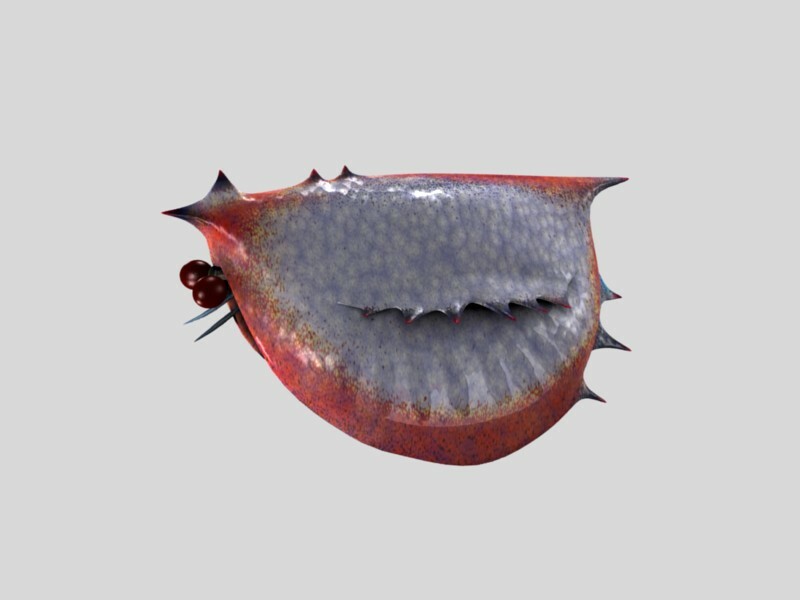 The specimens described here represent the first microanatomical evidence confirming the view that highly developed vision in the Early Cambrian was not restricted to trilobites. Furthermore, in possessing more and larger lenses, plus a distinct bright zone, they are substantially more complex than contemporaneous trilobite eyes, which are often assumed to be among the most powerful visual organs of their time. The new fossils reveal that some of the earliest arthropods had already acquired visual systems similar to those of living forms, underscoring the speed and magnitude of the evolutionary innovation that occurred during the Cambrian explosion. This entry was written by whyevolutionistrue and posted on June 29, 2011 at 11:15 pm and filed under Uncategorized. Bookmark the permalink. Follow any comments here with the RSS feed for this post. Both comments and trackbacks are currently closed. Well, there is some hope yet taht someone will find a fossil with a clear cast of the eyes as well as a recognizable fragment of the rest of the animal. Biologists have all the fun. Great post. What a neat story, and I love that Tuzoia reconstruction! When I read “bivalve arthropod” I pictured something like today’s ostracodes–not something like that! Very cute critter. But now I can’t stop thinking of the Rolling Stones. that’s funny–first thing I thought was that it looked like a googly-eyed ostracod! Or, put more properly, supporting the view that there was no explosion at all, just a deep ancestry from which we have no fossils. That is a truly bizarre looking animal. Those creatures have MORE eyes than today, THAT’S ANTI EVOLUTION! “Dalilips” would be such a great genus name! Does anyone know whether the total number of ommatidia in these eyes — or in any compound eyes — is a Fibonacci number? Compound eyes seem like the perfect place for the Fibonacci sequence to affirm itself. PZ already got a message from a creationist that this complex form in the Cambrian falsifies Darwinism. Rabbits can’t be far behind! I totally expected them to do this… I also thought of rabbits… I think he said Pre-Cambrian, but still. Oi vey. Is it too early for mantis shrimp eyes? Mantis shrimps look as if they still have a Cambrian propulsion system.